The clan is gathered at the table passing the stuffing and gravy plus countless other typically gluten-containing dishes on which individuals with celiac disease must pass. A surprisingly modest amount of tweaking, however, can enable people with this autoimmune disorder to enjoy every bite of the feast. “Thanksgiving is one of the easiest meals for people with celiac disease, as long as you’re doing everything fresh,” says Frank Baldassare, a gluten-free/allergy-friendly lifestyle authority and host of the online cooking show The Missing Ingredient (www.themissingingredienttv.com), who has firsthand experience living without gluten. And for clients with celiac disease, a worry-free meal provides a great reason to be thankful. The inherently gluten-free nature of dinner’s focal point supplies an advantageous foundation. After all, as Elaine Monarch, founder and executive director of the Celiac Disease Foundation, notes, “Turkey is turkey.” Unfortunately, problematic ingredients may be added between farm and fork. To illustrate how easily this occurs, Tribole says simply placing a dinner roll on a plate and removing it may result in cross-contamination. Even miniscule amounts of ingredients with gluten on a kitchen prep surface, cutting board, or a cook’s hand can also contaminate other foods. “The FDA’s legal definition of gluten free is 20 parts per million. To give you a visual, that’s one tiny speck of crumb in a bread,” Tribole says. Although a traditional wheat bread stuffing is off the menu, alternatives are deliciously varied. “The easiest way to make gluten-free stuffing—and to stretch food dollars in a bad economy—is to hold onto the heels of your gluten-free bread and put them in a bag in the freezer,” says Baldassare. “When Thanksgiving rolls around, toast the bread directly on an oven rack until [its] brown and dry, break into small cubes, and season with salt, pepper, and fresh herbs.” These croutons are then ready to go into your favorite bread-stuffing recipe. Baldassare offers a reminder to check the gluten-free status of any sausage included in the stuffing. “Many companies use gluten fillers in their sausages,” he says. Going with the grain is another option, if explored carefully. “Some of the grains can be problematic,” Baldassare says, listing barley as a source of gluten. To ensure oats are safe, stick with designated gluten-free products such as those made by Bob’s Red Mill. “Kasha, a kind of buckwheat that a lot of kosher people eat, is gluten free and prepared in a gluten-free environment, so you could use that. Quinoa, a great grain with a nutty flavor and a texture like couscous, is a perfect substitute for stuffing. 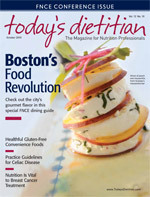 You can doctor it with dates and nuts and seasonal flavors,” Baldassare explains. Prerinsed quinoa eliminates the step of washing a naturally occurring film from the grain. Rice, too, may be swapped for bread in stuffing. Manufacturing processes may create contamination, though, so encourage clients to check labels or choose a reliable brand. The wide spectrum of colors, tastes, textures, and blends offered by Lundberg—all certified gluten free—elevates rice stuffing to gourmet fare. Freshly prepared side dishes afford the most control of ingredients. “I always talk to people about making things from scratch, especially cranberry sauce, which is so easy: Buy some cranberries, boil them in water, add a little tangerine or orange juice and honey, and you’ve got homemade cranberry sauce,” says Baldassare. “Canned cranberry sauce in itself could be fine, but you have to be careful about where it’s manufactured.” If the plant processes wheat products, cross-contamination can occur. Traditional green bean casseroles contain less-than-obvious glutens. “Those crunchy onions on top are made with flour. And if canned soup is used, that has flour, too,” says Tribole. A homemade version, prepared with heavy cream and topped with crisped shallots, supplies a sophisticated substitute. Gravy and sauces usually thickened with flour may be prepared with cornstarch or rice flour, or look for gluten-free mixes made by Road’s End Organics and Maxwell’s Kitchen. “There are so many more choices in gluten-free processed foods than there were 30 years ago,” says Monarch. “It was not a $2 billion business then.” Whole Foods Market carries an extensive selection of gluten-free products, and a recently debuted gluten-free version of Bisquick will put biscuits on the Thanksgiving table. There’s no need to skip iconic pumpkin pie—clients can just make it with a frozen gluten-free crust or mix, prepare the crust with almond flour, or watch the kosher episode of The Missing Ingredient for a fabulous quinoa tart crust recipe. Guests with celiac disease can also ask their host to pour a serving of pumpkin filling into a custard cup. “Those can be baked together in the oven as long as they don’t touch,” says Tribole. Eating only the filling from a wheat crust is a risky endeavor for people following a gluten-free diet. “When the knife cuts through the crust and is pulled up through the filling, the pie is contaminated,” says Tribole. And that’s a pretty sweet way to end a celiac-friendly Thanksgiving meal. — Lenora Dannelke, a freelance writer based in Allentown, Pa., covers food and travel for numerous publications. Meanwhile, place a small, heavy skillet over medium-high heat. When it is hot but not smoking, add pine nuts. Toast until nicely browned, stirring constantly, about 3 to 5 minutes. Transfer them to a plate and set aside to cool. Add 1 T of olive oil to a skillet over medium heat. Swirl to coat the pan and cook the celery, carrots, and onion until soft and lightly browned, about 5 minutes. Add the thyme, sage, and parsley and cook 1 more minute. Remove from heat. When rice is tender, add cooked vegetable mixture to rice. Add reserved pine nuts and cranberries and stir to combine. Add a few grinds of pepper. Taste and adjust the seasonings.